Mobile search optimization is not something that users should be thinking of, but it’s something they should be doing now. 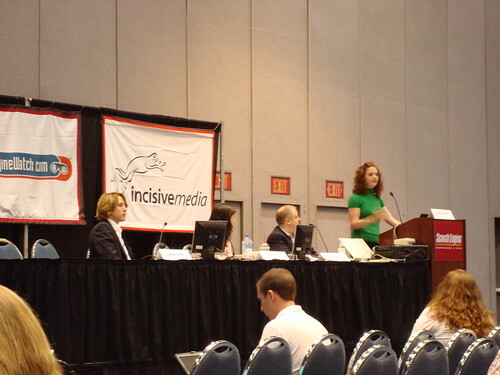 Rachel Pasqua of iCrossing said there are 2.3 billion mobile subscribers compared to 1 billion computer users. It’s easy to forget that not all jobs require the use of a computer on a daily basis. But, most jobs require a mobile phone to stay connected. Gregory Markel of Infuse Creative stated that WAP or .mobi is no longer dominating the mobile scene. With the introduction of the iPhone, the Nokia s60 and Opera Mini True Web Browser, the real web is quickly becoming available. However, most users don’t have those phones yet and we need to start optimizing sites for mobile phones that are currently in the mass market. 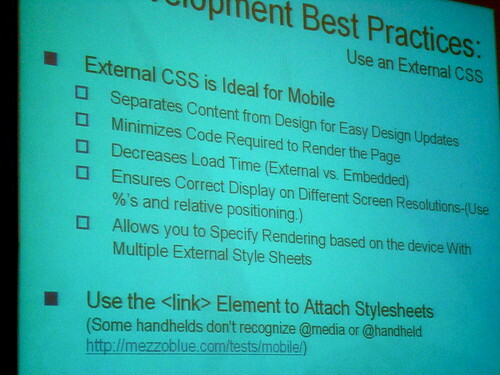 Gregory stated that there are really three ways to get your site optimized for mobile. One website with different style sheets for screen (web browser) and mobile. Separate sites for mobile users. Like m.website.com and code that site just for phones. Get into local directories like Google local so that GOOG 411 can bring up your listing and information when people use the voice activated searches. Cindy Drum of Blue Moon Works stated that mobile is an industry that is in it’s infancy and there are lots of things to consider. There are many different browsers on many different phones at different speeds to be concerned with. Follow all SEO best practices. Code in XHTML as it’s less forgiving to code errors and will help ensure your site looks good on all platforms. Use %s for sizes instead of pixels as that’ll help ensure that things scale down. Hide items in the mobile CSS or re-arrange items to ensure that content isn’t pushed to far down the mobile page. Submit mobile sites to mobile search engines. Have a mobile site map. Provide relevant info for mobile users. Things like phone, address and hours of operation in the header and/or footer. Make phone numbers clickable so users can click and call. Optimize videos and podcasts to mobile too. Use jump links to drive traffic down to content areas on your site. Avoid Flash or other custom applications as not all phones will support all plugins. There are items that you can do today to optimize for the mobile web, however you should take a good look at your website a few different mobile phones to get a true indication of what your users may be seeing. They had this session for the first time in December, 2006 in Chicago and oh my how everything has changed! You need to be doing this now, but having a clear idea of what to do as by the time you do it it might once again be totally be obsolete. I think each business should look at their customer acquisition model and determine if this is urgent or not. If you are dealing with high touch, expensive B2B products or services you might decide to wait until the standards settle down a bit. If you are a local business you MUST be thinking about this now. This actually looks similar to the session I attended at SES Chicago last year. It’s fairly disappointing that, even though the state of mobile search has grown leaps and bounds since then, the level of knowledge at SES has not. To help advance the field a bit, Resolution Media has developed a mobile search optimization white paper that actually expands on what was said here and specifically addresses the mobile SERP. We’ll be releasing it on MobileSearchOptimization.com soon. If you’re interested in actually doing mobile SEO and you already know how to validate your web site for mobile browsers, I would highly recommend it. Cindy Krum always does a great job and gives lots of information. I totally agree, Rachel. I just think the information that I’ve heard her give is mostly related to mobile development best practices from the W3C, which is not exactly the same as mobile search optimization. I’ve detailed my argument and given even more information about mobile SEO on my blog if you’re interested. Thanks! Ya, I agree. But I think her point is that mobile crawlers evaluate your website as if it was being displayed on a mobile phone-so being W3C compliant is important. No doubt. In theory the two are related, especially when it comes to properly indexing a web site. However, when it comes to ranking (and indexing to some extent), it fails to explain the sheer mass of non-compliant, inaccessible web pages in the first three listings of mobile SERPs for some very competitive queries. In fact, in our research we found that the vast majority of listings on the first page in Google Mobile and Yahoo! Mobile are not compliant or even accessible. If it were really that important from an indexing standpoint, these sites would not be in the index; and if it were really important from a ranking standpoint, these listings would be usurped by their accessible counterparts. Since this is largely not the case, I’m not convinced that accessibility is absolutely essential for mobile SEO. As I say in my blog post, I appreciate Cindy Krum and others for being evangelists for mobile search optimization, and my aim is not to denigrate their role in bringing valuable information to the SEO community. My point is that the current level of discussion at this point (including the presentations from SES) doesn’t extend beyond the Google Mobile Webmaster Guidelines. I’d like to move it forward, faster. I appreciate your comments, Rachel, and hope that you will give me feedback on the detailed blog post I’ve written on this subject and the white paper when it comes out. Does anyone recommend a particlar site template to use or maybe a program that is mobile friendly? Then just use CSS and HTML to design.